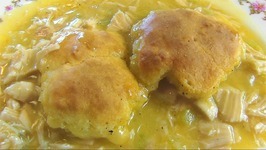 Betty demonstrates how to make Chicken and Dumpling Casserole. This is a quick and easy entrée that tastes fantastic. Betty demonstrates how to make Sausage-Pineapple Casserole. 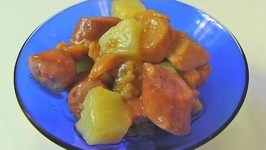 This casserole is made up of smoked sausage, pineapple chunks, and sweet potatoes. The flavors blend beautifully. Betty demonstrates how to make Chicken Taco Bake. This recipe was sent in by Tori Durham of Burlington, Ontario, Canada. 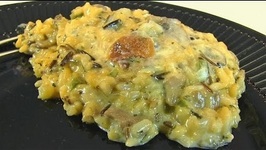 Betty demonstrates how to make Cheesy Wild Rice Casserole. 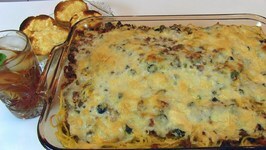 This is a flavorful, hearty casserole that is very easy to make. Betty demonstrates how to make Cheddar Onion Potato Bake. 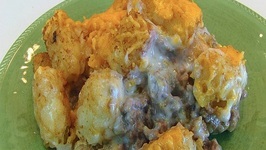 This is a cheesy potato casserole that is made from mashed potatoes, French fried onion rings, and Cheddar cheese. Betty demonstrates how to make Chili Casserole. 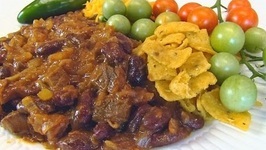 This casserole has sirloin steak, dark red kidney beans, tomato soup, and chili seasonings. Betty demonstrates how to make Easiest Ever Turkey and Dressing Casserole. 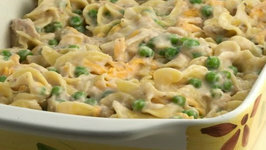 This casserole is made from cooked turkey breast, packaged dressing mix, chicken broth, and ..
Betty demonstrates how to make a Layered Spaghetti Casserole. This casserole is layered with spaghetti, meat sauce, and cheese, and it makes a large amount. Quick and easy dinners take the stress off of your typically busy day. Time schedule is very tight on my kids soccer practice/game day and I have very short time to put ..
Betty demonstrates how to make a Crustless Potato Quiche for Easter. 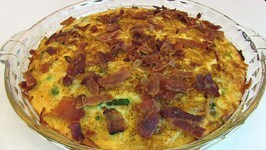 This is a hearty potato/egg casserole that can be used to replace a traditional potato dish. Looking for a nutrition packed delicious meal? Look no further, a simple delightsome recipe is here for you to make, can assure that you're going to have a smile after ..
Chicken Mushroom Casserole is an amazing meal that can be made in around 30 minutes! Chicken Breast Fillets are combined onions, mushrooms, mustard and chicken stock to ..
Easy Beef Casserole is a deliciously simple main meal. 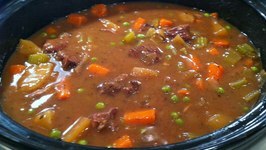 Succulent beef pieces are slow cooked with potatoes, carrots, onion, garlic and tomato to create a filling, satisfying stew. In this episode of how to Christmas cooking, learn how to create the delicious Swedish casserole known as Jansson's Temptation a favorite for Swedish families around Christmas. 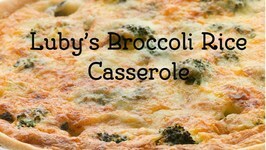 Luby's Broccoli Rice Casserole is a great side dish to make anytime. 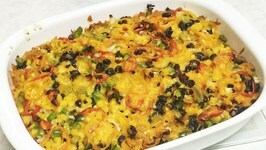 Broccoli Rice Casserole is one of my favorite recipes for the holidays. Everyone loves Broccoli rice casserole. 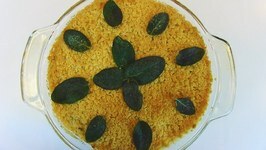 Betty demonstrates how to make Creamed Corn with Fried Sage Leaves. 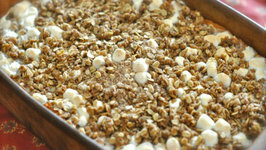 This is a great holiday casserole that consists of corn, milk, eggs, butter, and flavorings. Growing up in the south I learned at an early age to appreciate the healing powers of a good casserole. The downside is that many of these dishes aren't very healthy. 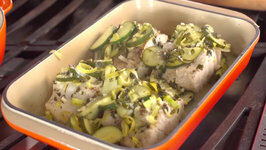 Try this striped bass to freshen up your dinner menu! 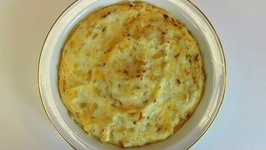 Betty demonstrates how to make a Sour Cream and Cheddar Potato Casserole. 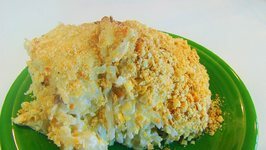 This casserole consists of seasoned shredded potatoes, coated with a mixture of sour cream, ..
You can make this delicious Boston Market Sweet Potato Casserole at home. We start with fresh sweet potatoes and we bake them. Betty demonstrates how to make Ground Beef and Tater Tot Casserole. 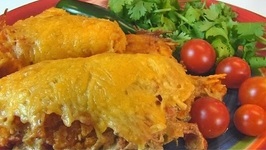 This recipe was sent in by Tori Durham of Burlington in Ontario Canada. 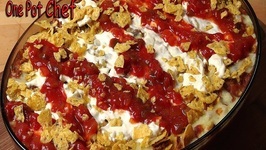 Taco Casserole is a simple main dish, perfect for easy weeknight dinners, Super Bowl parties or kids sleep overs. Betty demonstrates how to make Chicken Casserole Supreme. 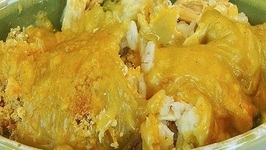 This is a great chicken recipe that has layers of chicken, rice, green peas, mushrooms, onion, Cheddar cheese, .. 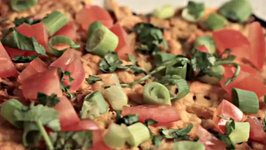 Chef Barry Lewis from My Virgin Kitchen shows us how to make a delicious chicken taco casserole! 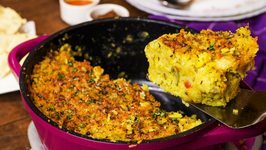 A perfect twist on 2 great dishes, hearty and great to share with the family.